The SR16 drum machine has been around for 20 years or so, and appears to have been steadily shifting units for Alesis the whole while. This unit, still available now, is a robust little box with 12 velocity‑sensitive pads, a decent core drum-sound ROM, pattern-based sequencing, and the kind of straightforward design that suits even the non-technically minded. So rather than trying to fix something that clearly ain't broke, Alesis have decided instead to concentrate the majority of their attention on expanding the quality and usefulness of the SR16 concept without changing its basic character. The result of their efforts is the SR18. For a start, a number of simple but useful hardware updates will certainly be well received, such as the LCD backlight, the option to run from six AA batteries, a responsive tap-tempo function, and the addition of a data wheel in place of the SR16's volume control (now smaller and around at the back). A rear-panel instrument input will also appeal to guitarists wanting to jam along with their pattern-based creations, and although this offers no gain control, I was easily able to get a usable level straight out of a Strat, and could also monitor the output of an external modelling guitar preamp with a little tweaking of its output level control. Also new are the Drum, Perc and Bass keys, the hardware manifestation of perhaps the biggest expansion in the module's capabilities, namely that its existing drum-kit setup is now joined by two other Instrument Layers, taking advantage of an expanded 32MB of sound ROM and doubled 32-voice polyphony. The first of these extra Instrument Layers is pretty much identical to the existing drum‑kit setup, except that the sounds come from selections of the onboard percussion samples. In fact, the distinction between Drum and Percussion kits is pretty notional, given that you can actually assign any of the samples to any of the pads in either kit, so in effect you're just getting a second pad bank. The Bass button accesses the third Instrument Layer, a 'kit' containing a single bass instrument chosen from a selection of 50 or so included multisamples. Naturally, for this Instrument Layer the pads access different pitches rather than different sounds, so you have the sensible option of transposing the 12 available pads across a three-octave range. To further expand the sonic potential, the Drum, Perc and Bass kits have had their editing parameters bulked up, with basic low‑pass filter and amplitude envelope controls added to the volume, pan, tuning, triggering mode and output assignment settings already present. You can also swiftly mute any of the three Instrument Layers using their dedicated buttons, which is handy when you're trying to work out whether the Drum or Perc set contains a particular sound you're hearing. The volume control has made its way around to the back panel of the SR18, from its previous location on the front of the SR16. The other notable change to the rear-panel furniture is an instrument input that's ideal if you're a guitarist who'd like to play along with a drum pattern. You can even complete the track with a bass line, courtesy of the SR18's new bass-layer facility. Effects make their first proper appearance on the SR18 too, with two preset-driven processors on hand. The first is a joint EQ and compression device, while the second is a similarly frill-free reverb. The former can be switched on and off for each drum sound or bass instrument, while the latter is fed from individual send controls. The dozen 'EQ + compression' presets are mostly pretty heavy-handed, but there are a few more subtle general-purpose settings in there, which are likely to receive most use in practice for evening out any level differences between different kits and maximising the signal level at the machine's output sockets. The reverbs are fairly respectable, as you'd expect from Alesis, and although most of the 20-odd presets are far from subtle, there are a few more subliminal general-purpose settings there to keep the sound in line with drier modern production styles. Fortunately, you can bypass either or both effects if you like. As far as the sequencing capabilities of the SR18 go, things are pretty much as they always were, although the extra Instrument Layers mean that you can now assign a separate MIDI channel for each when triggering sounds remotely from a MIDI controller keyboard or external sequencer. One neat little extra, though, is the facility to assign sequencer patterns to pads for quick playback in a live situation, a facility that will be familiar to anyone who's used a similar feature on the recent Akai MPCs. It's a bit of a shame, though, that you can't also use this facility for chaining patterns together in Song Record mode. Listening through to the demo song and the preset patterns on first getting the SR18 out of its box, the sounds (especially the basses) often came across as pretty dated to me, with 'stuck on'-sounding effects and a mix weighed down with uncontrolled sub-bass. To my relief, however, once I'd delved further into the unit's architecture I found that bypassing the two new effects blocks immediately remedied much of this, and that despite a few '80s howlers (chorused slap-bass, anyone?) it turns out that the raw sounds are varied and well‑balanced, on the whole. In addition, the extra editing controls expand the potential of the sounds considerably, especially the envelope decay for drums and the filter cut‑off for bass. The bass multisamples are fairly mediocre, with obvious looping in their sustains (as befits the limited ROM space), but they are at least polyphonic and respond to velocity and pitch-bend, for a certain amount of expression. I found a good few of the built-in waveforms too overstated for general-purpose use, but there is still a significant number of solid synth and bass-guitar workhorses to deal with most normal eventualities, as well as a decent sine-wave sub-bass patch — good call there! Despite my views of the effects usage in the demos, the two processors actually provide some useful presets, and while presets inevitably reduce flexibility, they're actually fairly usable when kept well clear of the 'cheese' zone. Of course, the very nature of this kind of ROM-based sample-playback machine means that the levels of realism available won't be able to match those of dedicated virtual instruments in a computer studio situation, but the continuing demand for the SR16 demonstrates that this isn't the be-all and end-all when choosing a drum sound source — particularly if you're playing live. Overall, I'd say that the SR18 is a worthy big brother to the SR16, and I can see no reason why it shouldn't build on the proven success of the earlier machine. When it comes to dedicated hardware drum machines, the market is fairly narrow. The main competition comes from the Boss DR670, although the slightly pricier DR880 offers more powerful sequencing and built-in physical‑modelling guitar effects. For a more hip‑hop/R&B slant, Akai's MPC-influenced XR20 is worth a look. If you just need Alesis drum sounds without the built-in sequencing, another option for a similar price would be the Alesis DM5 rack module, which also includes triggering facilities for drum‑replacement duties. A wide-ranging collection of solid drum one‑shots and bass multisamples that should cater for most styles of music. More sounds, editability and polyphony than the SR16. The ability to trigger sequencer patterns from the pads for live performance. In an age of multi-gigabyte virtual instruments, ROM-based sample-playback units such as this face much tougher competition in the studio, particularly where realistic-sounding acoustic drums are required. As solid a performer as you'd expect given the heritage, but with much more sonic scope than its forebear, the SR18 should certainly be on the shortlist of anyone in the market for a hardware drum machine. 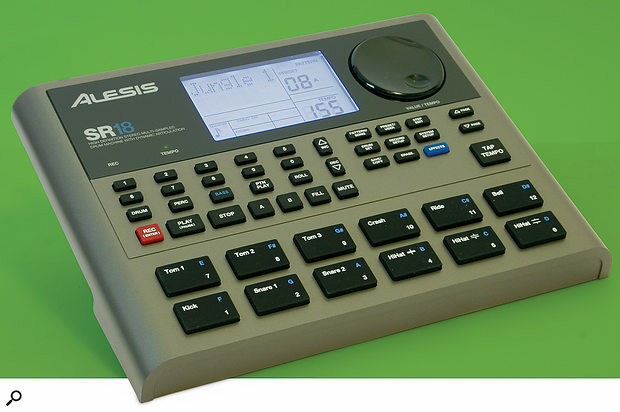 Alesis +1 310 821 5000.